I learned about nature printing from an article in the publication now called Northern Gardener. The first nature printing workshop I took was in December 2001 with my teacher, Sonja Larsen, who wrote the magazine article. I’ve been printing plants ever since. The best thing I’ve learned from printing plants is to really see and appreciate the natural world around me, and to have opportunities through classes and demonstrations to guide others to have a greater appreciation for our shared environment. It’s also rewarding to identify and print leaves and plants that grow in my yard and neighborhood during the variety of seasons we experience in Minnesota. Demonstrating nature printing to children and adults is a delightful experience at Wet Paint Artists’ Materials and Framing in St. Paul, where I got my start in 2002, and at art centers, art tours, native plant nurseries, private gardens, and elsewhere in the Twin Cities metro area and western Wisconsin. I also very much enjoy teaching classes and showing and selling my note cards and original prints. I’m a member of the Nature Printing Society, the Minnesota Landscape Arboretum, the Minnesota Native Plant Society, Wild Ones Twin Cities, White Bear Center for the Arts, the Edina Art Center, Highpoint Center for Printmaking, and the Colleagues of Calligraphy, and work as a writer and graphic designer from my home in south Minneapolis. Sat., Dec. 13, 9:30 A.M.–4:30 P.M. 7220—Sat., Oct. 25, Noon–3 P.M. Sat., Oct. 11, 9 A.M.–4 P.M. This urban garden is a Monarch way station & pollinator habitat. You must see it—and the artwork of Paul Damon & Liz Carlson, along with my prints & note cards. Sat., Sept. 6, 10 A.M.–4 P.M. Sat., Sept. 20, Noon–4 P.M.
Hi Sue. Happy to see you are still doing your beautiful leaf printing! We are busy again after a slow start to the year. And the big news is that we are moving to our home in Maine this fall. Know anyone looking for a charming bungalow in Linden Hills? It was so nice to meet you last night. I look forward to seeing you at future Salon events and possibly having you share your knowledge with some Girl Scout volunteers in August. I was so excited when I stumbled across your website by chance today. Do you remember me, your former alley neighbor? I now have a store in lowertown St. Paul called Three Sisters Eclectic Arts. We sell work from all Minnesota artists and artisans and host art classes. Sent me an email or note if you are interested in joining us. Hi Roma, It is so nice to receive your greeting. Thank you. I look forward to seeing you this summer. 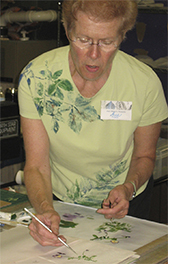 Sue, Thank you so much for being our Washburn Library Artist on Saturday! I really enjoyed working with you and know that I will enjoy sending the cards to friends and family. Now I need to take some time away from volunteering at the library and LOOK carefully at each of your prints! Thanks for the ride home in the rain also! Hi Kathleen, I was happy to meet you last Saturday and grateful for your friendly, enthusiastic sales of my note cards. I’m pleased that a percentage of the sales will contribute to the generous work you and other Friends of the Washburn Library provide on behalf of all of us who benefit from that community library. My husband commented that the librarians, guests, and the environment itself all seemed welcoming and friendly. I agree. Thank you so much, Kathleen. Really enjoyed my evening with you at Wet Paint. Don’t know where print making is going to take me… but I know I’m going somewhere with it. Hi Julie, THX for your kind comments. With your sense of color & composition, you’ll be absorbed by the endless patterns & possibilities present in printmaking. I know you’ll have fun!